New burdensome regulations, if they were a problem, would reduce productivity. Yet as this blog has noted previously (see here), productivity growth has in fact been quite good during the Obama period. The productivity concept normally used for such discussion is simple labor productivity, which measures output (GDP) per unit of labor input (either employment or hours of labor). This productivity concept is useful in part because it can be estimated as soon as one has an estimate of GDP, i.e. each calendar quarter. But it is not a measure of pure productivity, as output per unit of labor can rise due to several things, including from increased capital investment (more machinery and equipment, which improves productivity) or from changes in the composition of labor (towards more highly educated, and hence more productive, workers). Multifactor Productivity (also sometimes called Total Factor Productivity) is a measure of productivity that takes into account increased capital availability and other such factors. The Bureau of Labor Statistics of the US Department of Labor provides an estimate of it, but because it is more difficult to estimate, it only comes out with a major lag. On March 21, the BLS issued its estimate for 2010. Only annual estimates are made. And while the series only goes back to 1987 (and hence has growth rates only from 1988), it is interesting that while Romney and the other Republicans are complaining of a large increased burden on business from regulations under Obama, the BLS found that multifactor productivity grew faster in 2010 than in any year since they started estimating the series in 1988. 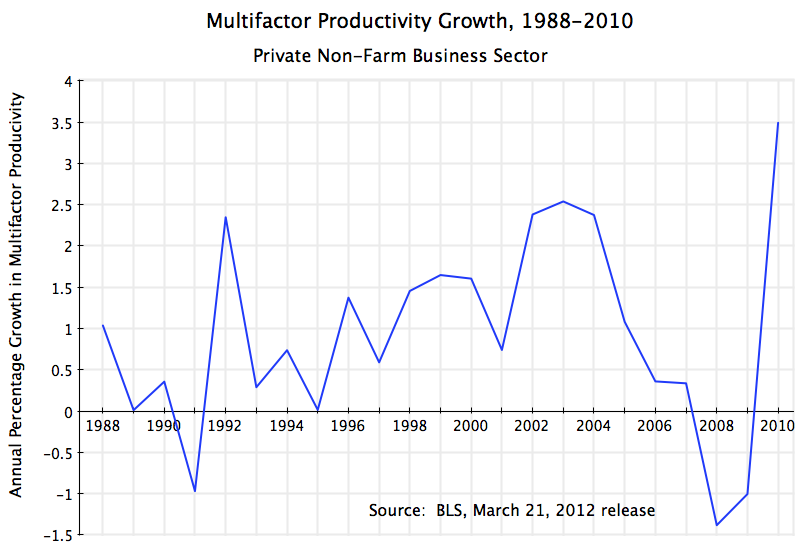 The graph above shows the BLS estimates of multifactor productivity (MFP) growth for 1988 to 2010, for the private non-farm business sector. MFP grew by 3.5% in 2010, reversing the downward trend seen since 2003 and absolute declines in 2008 and 2009. As noted, the 3.5% increase in MFP in 2010 is the highest in the history of the series. If Obama’s regulations were stifling businesses, one would not see such an upward bounce in productivity. The Republican charge is simply not consistent with the facts. One should also not jump to the opposite conclusion that the upward bounce in productivity in 2010 can be credited totally to regulatory or other reforms instituted by the Obama administration. It would be consistent with such reforms improving productivity (i.e. the opposite of what Romney and the Republicans have asserted), but it could be due to other factors also. The truth is that much of the year to year change in productivity can be accounted for by the business cycle. When economic output is falling, as it was in 2008 and the first half of 2009, productivity will typically fall (or not grow as much as in normal growth years), as businesses lay off labor only with a lag after they find they cannot sell all of their output. And in an economic recovery, productivity will rise, as businesses also only start to hire new workers with a lag. The same happens with business investment (and hence the stock of machinery and equipment and other capital available for use), so that capital is underused as economic output falls in a recession and then is more intensively used at the start of a recovery. Looking forward, it is likely that MFP growth will not be so high in 2011, and indeed might even be relatively low, as businesses started hiring new workers more aggressively in 2011 as the economic recovery continued (albeit slowly, due to still low demand for what they could produce). But we will not know for another year, when the BLS issues their estimate for MFP growth in 2011. The productivity data cannot by itself demonstrate conclusively whether or not the record high growth in productivity in 2010 was primarily due to measures implemented by the Obama administration. But what we do know is that the data is clearly not consistent with the Republican charge that Obama has imposed huge new regulatory burdens which have stifled productivity. This entry was posted in GDP & Productivity and tagged economic growth, productivity, Republican campaign by aneconomicsense. Bookmark the permalink.